I just took one other thing off my to do list: the rheostat developed a full-lights/no-lights behavior. I took the unit out to see if I'd be able to fix that. Problems turned out to be caused by oxidation of the contact strip. This is a step-by-step procedure. 1. take off the two small Philips-head screws that hold the bottom cover on the pod, and remove cover. 2. locate the small Philips-head screw that holds the Rheostat. It's a very tight area to work. I used a flex screwdriver. 4. find out if the resistor wire is in decent shape. Also check its function with an Ohmmeter. Turned out that I had a very high resistance between the copper connection strip and the actual resistor wire. 5. drill out the crimp pin at the wire-connection side on the strip, and bend the strip up slightly to expose the resistor wire. 6. use some sanding paper to remove the oxidation, and apply some dielectric grease (battery poles). 7. bend the strip back into place, and use a very thin screw to replace the drilled out crimp pin. 8. Make sure the resister wire end is hooked on the screw underneath the copper contact strip. 9. use a normal bulb and 12v power source to check the operation of the rheostat 10. put things back together in reverse order. I have a picture for you guys who don't have a clue what I'm talking about. Just send me an email. Spray a whole bunch of contact cleaner in there, spin the wheel back and forth many times, then blow out with compressed air. Put your finger on the wheel and spin it back and forth many many times. Self cleaning. I'm sorry, but maybe I was unclear in the message. Its *not* the contact strip on the resistor wire that has problems in my case. The contact strip and wire were really ok. You definitely don't want to bend that one up. Its the connection point where the +12v power feeds the wire. A fixed part on the rheostat body. That's where the oxidation took place at all the copper parts. So.... it would probably take a few cans of contact cleaner to make that connect again. 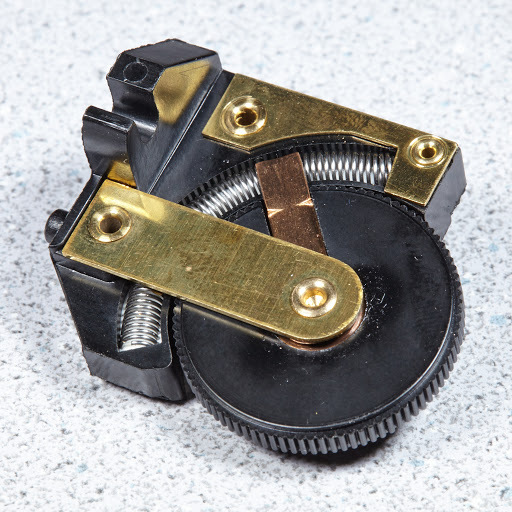 Generally speaking: if you have "blind spots" when turning on the Rheostat wheel, your up for the "spin the wheel" and use contact cleaner action. If you experience a clear digital behavior (lights fully on/off) without much regulation, you might consider pulling the Rheostat (eh eh...) and fix it as described. For those of you asking for pictures, I will send them in a minute.